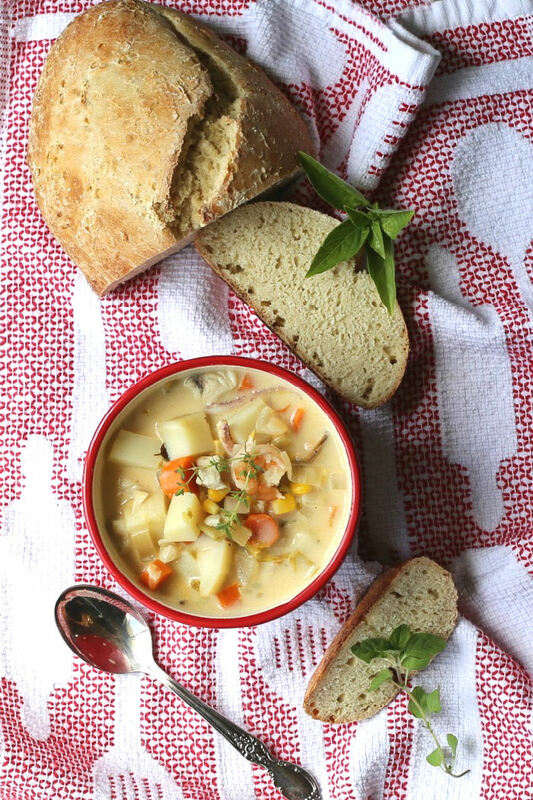 This light seafood chowder is brimming over with the flavors of white fish, succulent seafood and healthy vegetables for a summer time soup that reminds me of days on the coast of Maine. I spent my summers in Maine doing things that Mainers do when the temperatures get hot, even though it is only for a few months of the year. I live in North Carolina now and have no shortage of hot summer days. 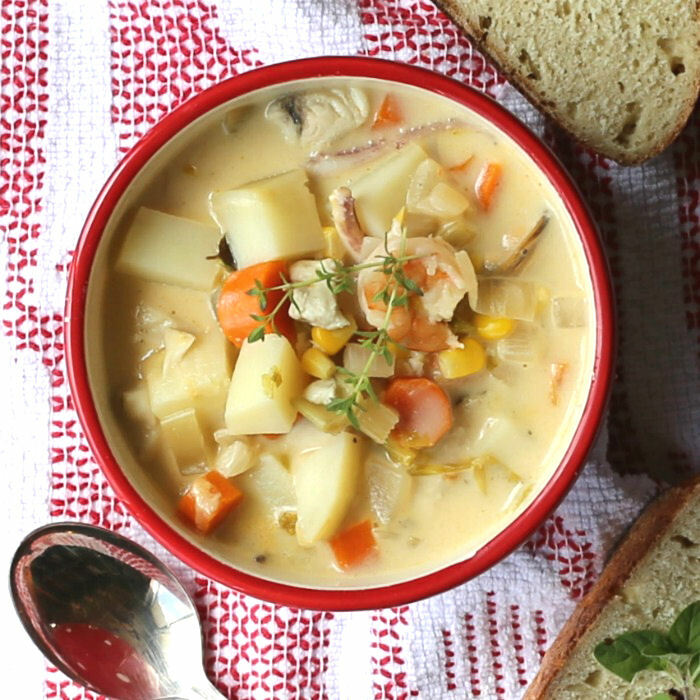 This lightened up seafood chowder is a reminder of my younger days in a tasty bowl that is just chock full of seafood tastes. Most New England seafood chowder recipes are full of cream and butter which makes for anything but a light dish. As I usually do, I start with the regular version and then make small tweaks in a recipe to come up with something that still tastes great but is not so heavy on the calorie bank. The word chowder comes from the French word chaudière which means cauldron. This type of cooking appears to have originated with fishermen who brought the recipe to Newfoundland. It spread from there through Eastern Canada and down to New England. New England Chowders are normally based on clams, but for today’s recipe we are letting all sorts of seafood into the dish! Clam Chowder even has it’s own National Day. January 21 is celebrated as National New England Clam Chowder Day. 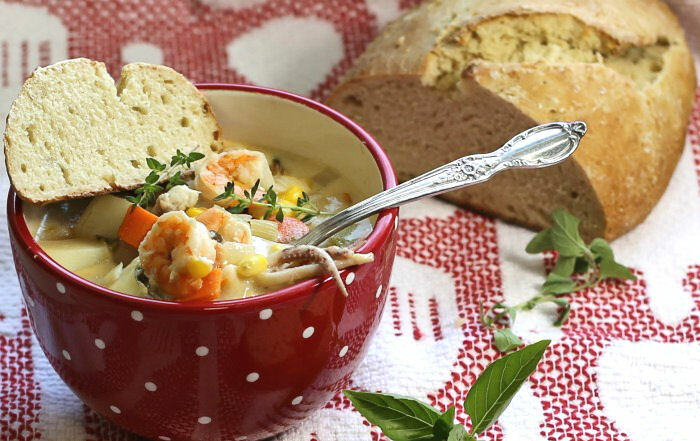 All types of chowders, from fish or corn to clam and seafood chowders, are very popular in Northern New England and the North Atlantic regions. 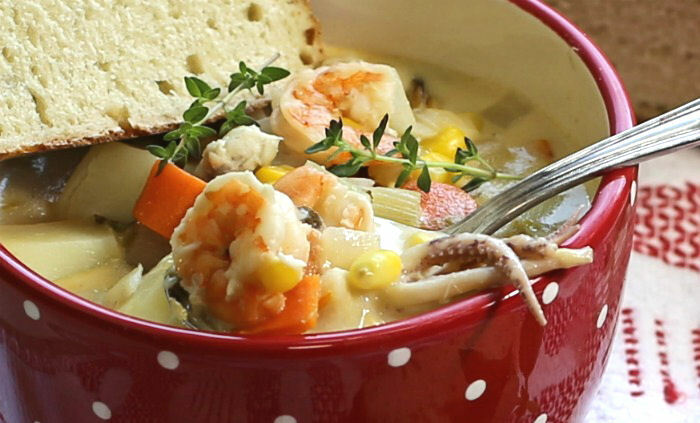 A good seafood chowder uses a big variety of fish and seafood for a great taste. 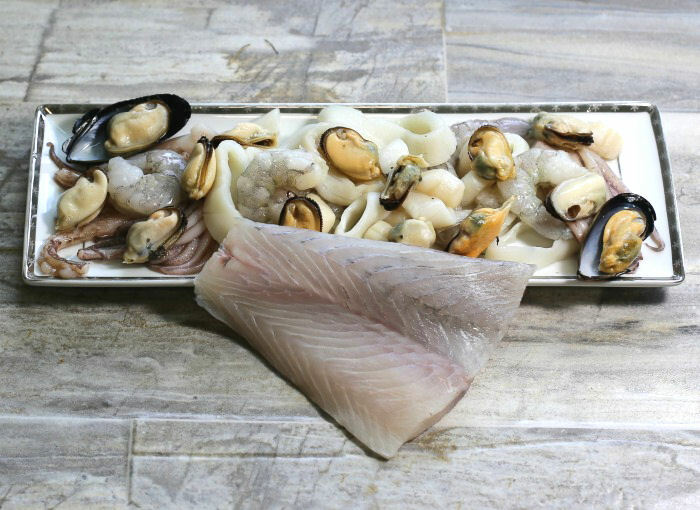 In our recipe I am using a seafood mixture that contains baby scallops, squid, jumbo shrimp, clams and calamari. Fresh white fish will also add some delicious taste to the mixture. All those types of fish and seafood means lots of lovely textures and tastes in the finished recipe, which I love. 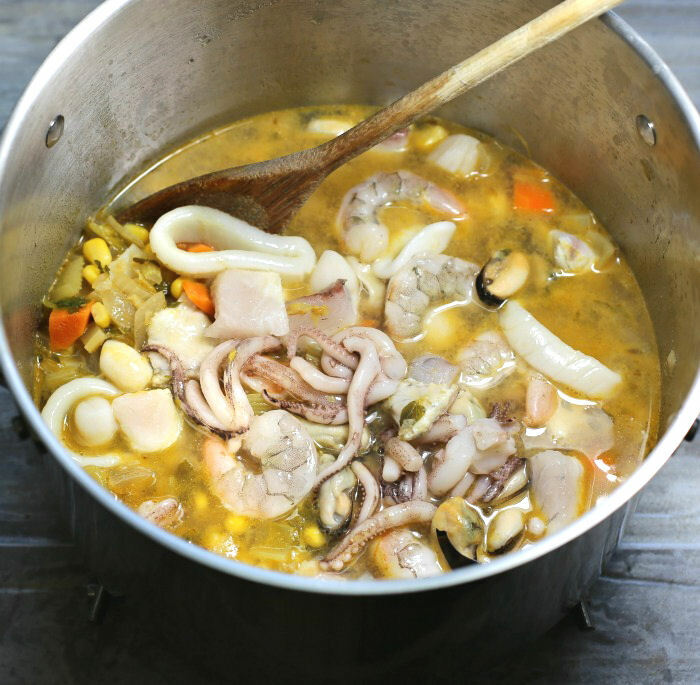 Seafood stews are not just made up of fish and a milk/cream mixture. 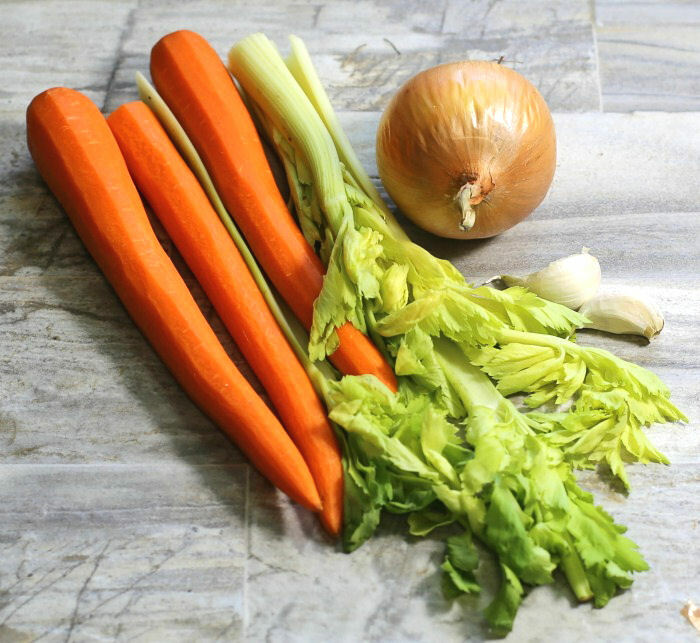 Fresh vegetables add lots of nutrious good taste, and give you the base of the stock, as well. We’ll be using carrots, onions, fresh garlic and celery, along with chopped potatoes and corn for a rich delicious flavor. To make the chowder base a bit lighter and more healthy, I am using skim milk as my base instead of cream or whole milk. I’m also using olive oil to cook the vegetables instead of butter. 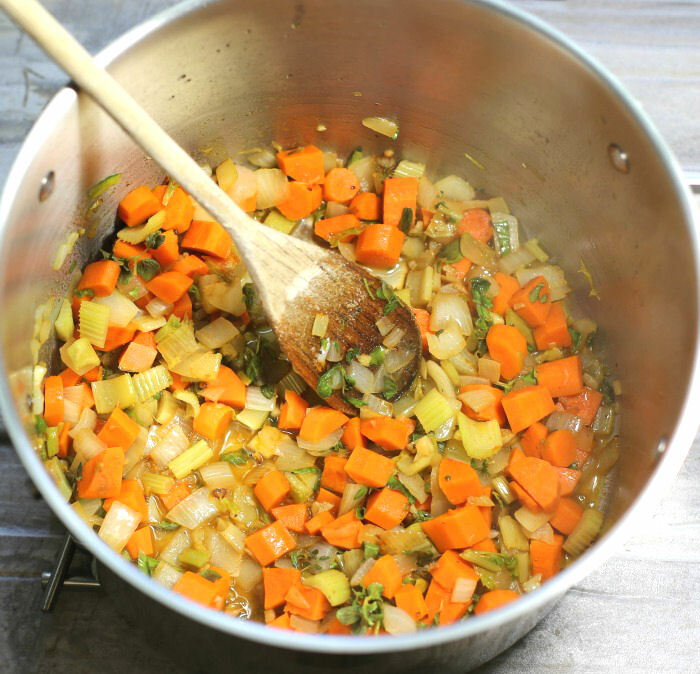 To thicken the stew, I use olive oil and whole wheat flour in the roux to make it more healthy. To get back some flavor that you lose when you take away the butter and whole milk or cream, I am using a bit of white wine for flavor. Many people believe that the alcohol and calories somehow disappear when it is cooked. This is only partly true (and mainly false). It depends on how long the alcohol is cooked and the type used. To evaporate the alcohol, the dish must be simmer for at least 15 minutes to get down to 40% of the alcohol (and calories). You would need to cook a dish for over 2 hours to really get rid of most of the alcohol. In our recipe, it’s flavor that I am going for. I’m using a white wine and only 1/4 cup of it which don’t have that many calories to begin with. What wine does have is taste and that won’t boil away with cooking! I have seen recipes that use evaporated milk to give a cream like finish, but I have tried this and it tastes like evaporated milk. So we’ll be using some cream. Just a bit – 2 tablespoons at the very end of the cooking time to add the creamy finish. Adding this small amount of cream only adds 103 calories to the entire easy seafood chowder and when you divide that by four, it means you pay 25 calories to the calorie bank for a creamy seafood chowder taste – worth it in my book! Start by heating the olive oil in a large Dutch kettle over medium heat. 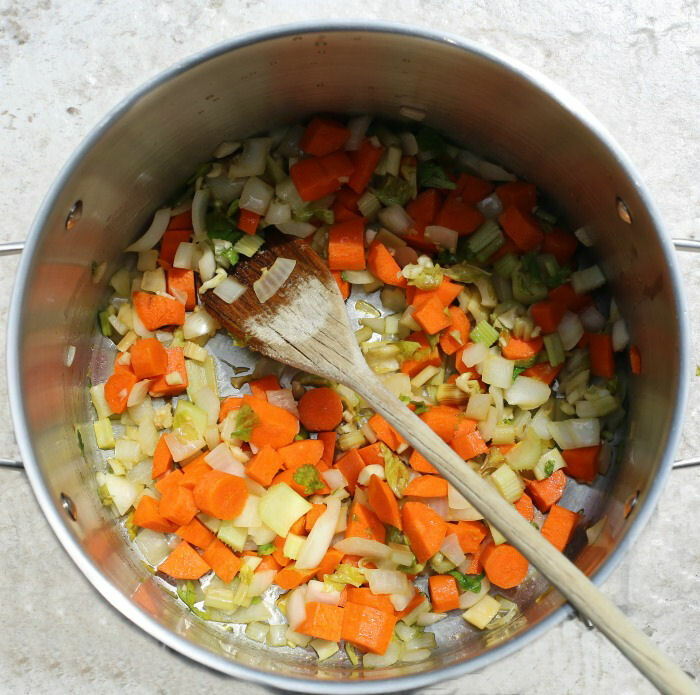 Add the onions, carrots, garlic and celery and cook until the vegetables start to soften, about 5 minutes. 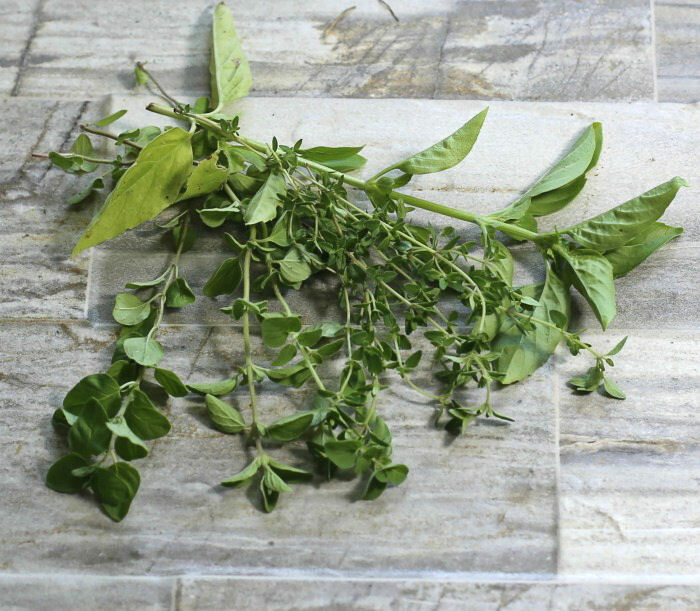 Next come the seasonings – in my book, a recipe is not a recipe without some fresh herbs and this one is no exception. My garden herbs are out in full force and I have lots to choose from. I’ll be using fresh basil, oregano and thyme as well as savory paprika, sea salt and fresh cracked black pepper. These flavors and some white wine will add a load of flavor to the chowder. Give it all a good stir and cook for a minute, then reduce the heat and cook until the wine has reduced by half. 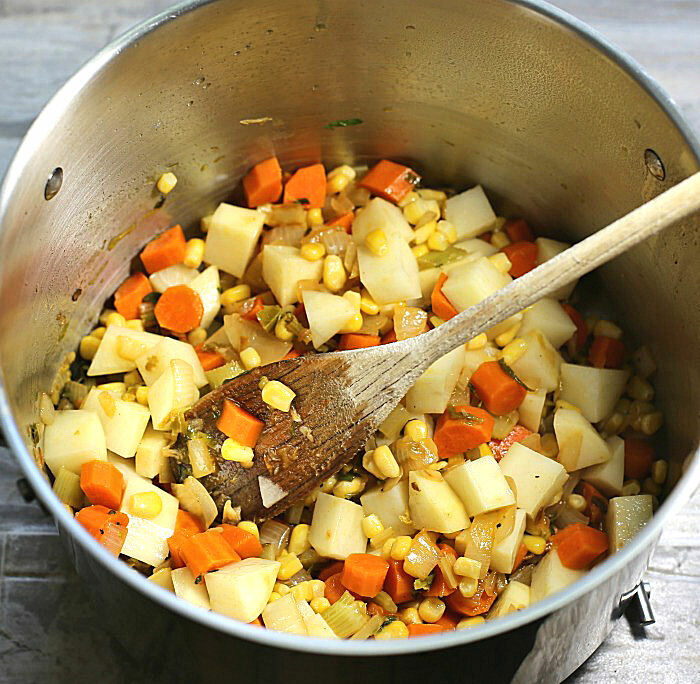 We’ll add the corn and potatoes now to give extra texture and finish off the flavorful base with some chicken stock and water to give moisture while the potatoes cook – another 10 minutes. You will need a separate pan to make the roux. You can make this while the corn and potatoes are cooking. It only takes a few minutes and makes for a really creamy and silky finish to the soup with no raw flour taste. Instead of butter, use olive oil and whole wheat flour to cook the flour into a paste, and then whisk in some skim milk to make a thick sauce which will thicken the stew. Time to add the fish! Add the fish ( I chose Barramundi but any white fish will do) and the seafood mixture to the pot of potatoes and add the roux. Cook this over a low heat until the seafood and fish are cooked through – another 10 minutes. Add extra seasonings if you need them, to taste. 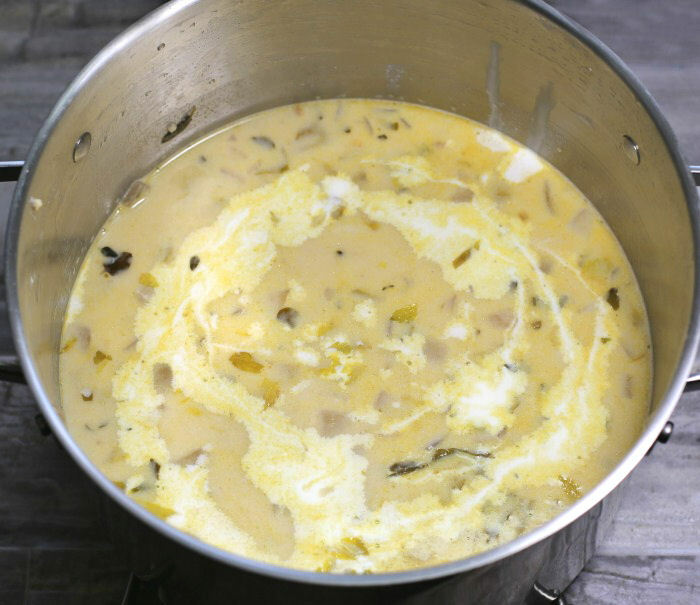 Finish off the light seafood chowder by adding the in the heavy cream and allow the soup to simmer for 20 minutes before serving. 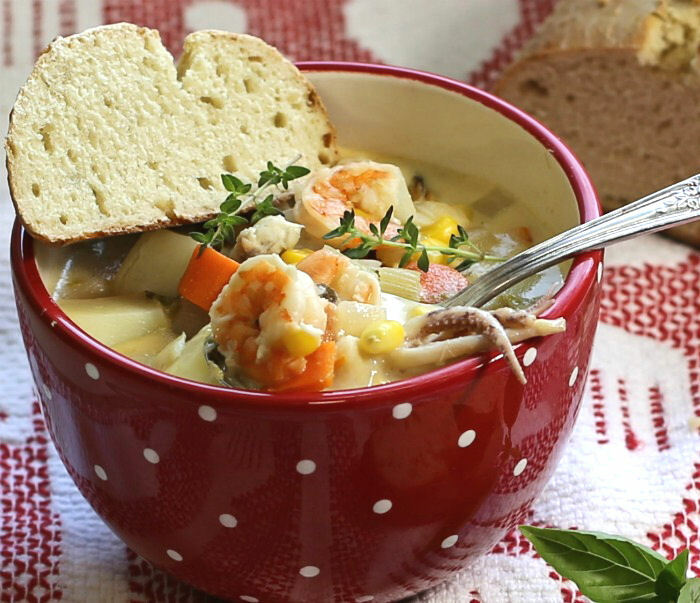 When the seafood chowder soup is done, garnish with more fresh herbs and serve piping hot. 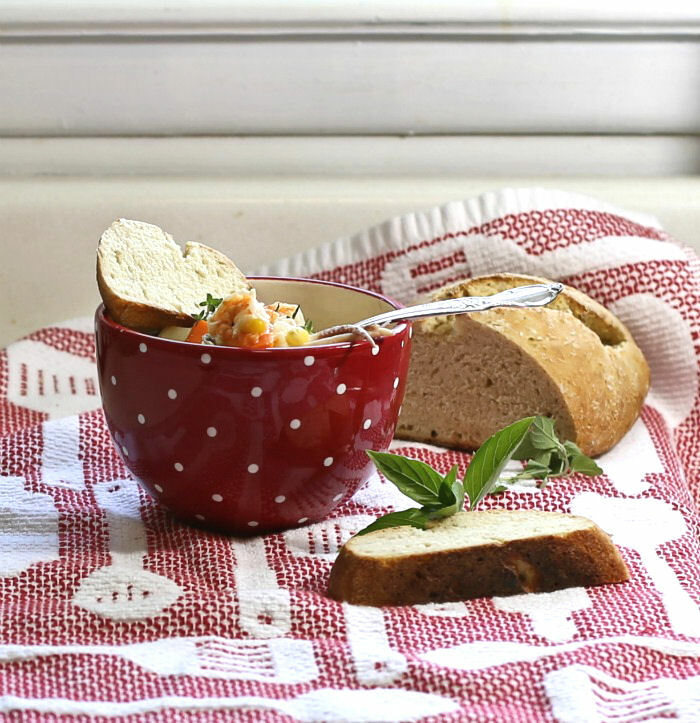 This recipe for seafood chowder is so flavorful and hearty. It has a creamy feel even though it’s made with skim milk and the texture is wonderful with lots of different foods swimming in the bowl. I love having lots of different seafood. Each time I dip in my spoon, I get a different taste. My husband and I fight over the squid! 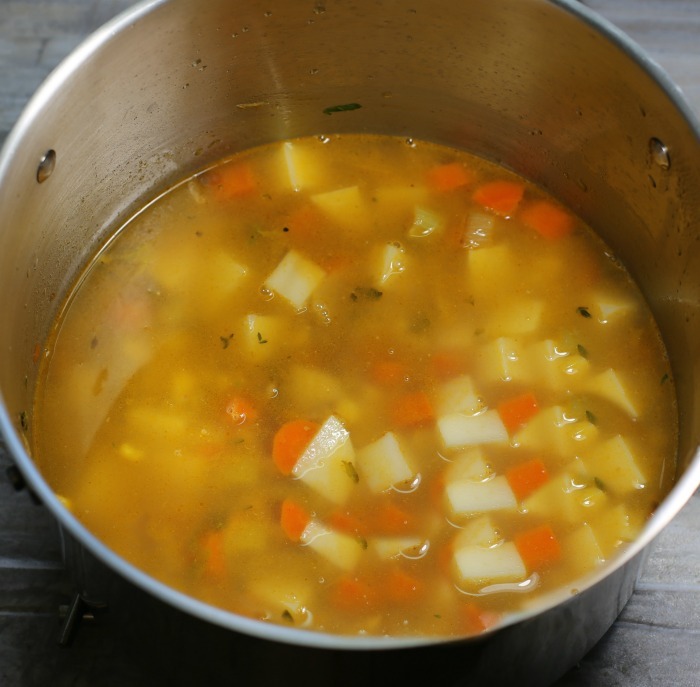 The soup serves four very generously with only 380 calories and loads of protein. Add some of my home made crusty bread for a very satisfying meal that your family will request often. The list of ingredients is quite long, but the soup is still very easy to put together. If you have an hour, you’ll have a big pot of soup that tastes like it cooked all day long! Other than making the roux, the whole thing comes together in one pot, which is great for clean up. If you would like to be reminded of this recipe later, just pin this image to one of your healthy food boards on Pinterest for easy access when you want to make it. 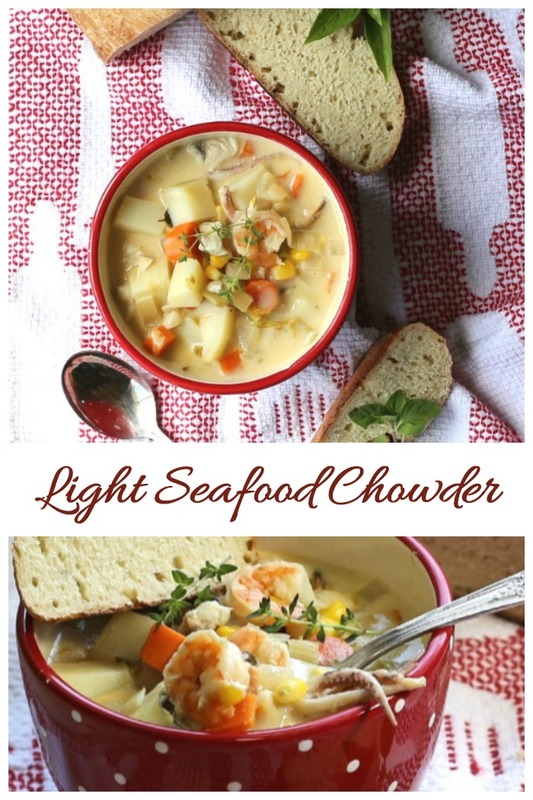 This light seafood chowder is brimming the the taste of scallops, clams, shrimp and fish in a skinny and creamy stock. Heat the olive oil in the bottom of a large saucepan over medium heat. Stir in the onions, carrots, garlic and celery and cook until softened - about 5 minutes. Add the salt and pepper, fresh herbs, wine, dill, and paprika and cook about a minute. Turn up the heat, cook, uncovered until the wine reduces by half. Add the corn kernels and cook a minute or two. Mix in the potatoes, chicken stock, and water making sure the potatoes are covered with liquid - if not, add more water. Bring to a boil, then lower the heat to medium and cook, covered, until the potatoes are almost done, about 10 minutes. To make the roux, heat the oil over medium heat in a separate pan. 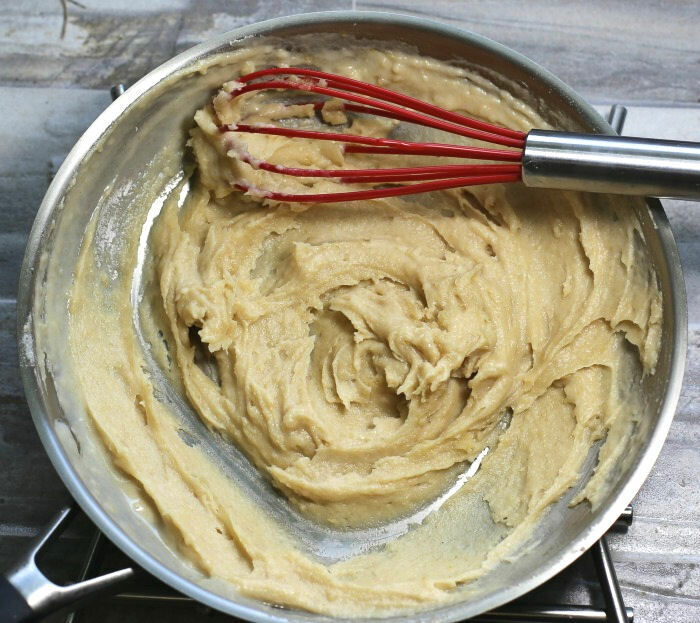 Whisk in the flour until a paste is formed. Gently whisk in 1/2 cup of skim milk until a thick sauce forms. Add the fish and seafood to the pot of potatoes along with 1 1/2 cups of skim milk, and add the roux. Return to the stove and cook over low heat, uncovered, until the fish and seafood is just cooked through, about 10 minutes. Season with salt and pepper to taste if needed. Remove the stew from the heat. Mix in the heavy cream and allow the soup to simmer gently 20 minutes before serving. Garnish with extra fresh herbs.